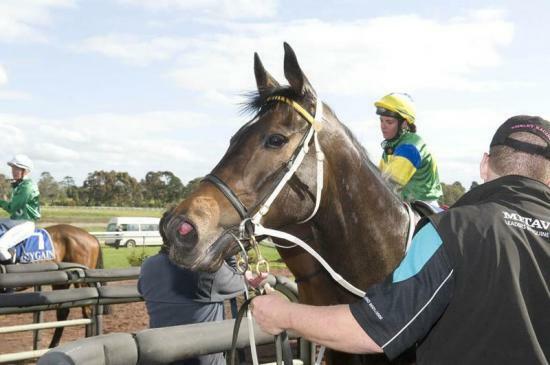 Prolific jockey Dean Yendall recorded his second win aboard Bioko – almost five years after the first – in the Elders Real Estate Handicap (2100m) at Swan Hill. Yendall steered Bioko to one of his three city wins in December 2007 but last combined with the Edwards and Elkington stable favourite in the 2010 Casterton Cup. The pair had little luck when reuniting after barrier 11 forced Yendall to work hard to find a position for Bioko early in the $15,000 event. The jockey was initially caught wide rounding the first turn before taking the initiative to send Bioko forward to settle fourth, one off the fence with cover, after the field had travelled 500 metres. The son of Jungle Pocket travelled comfortably just behind the leaders for Yendall before the rider sent him forward to join the leaders at the 400 metres. Bioko joined the leaders but was forced to dig deep under his 59 kg over the concluding stages. However, the eight-year-old refused to yield to his opposition, sticking on gamely to win by a short head. The win Bioko’s sixth from 66 starts but the gelding rarely runs a bad race, deserving his latest success. Bioko has won more than $130,000 for connections during his long career but he shows no sign of slowing down. Click here to view Bioko’s latest win.